Installing surveillance cameras is the most effective thing you can do to keep your home safe. When selecting a home security camera, you will be faced up with 2 options due to different lens: fixed lens, and varifocal lens. What is a varifocal security camera? How do you choose from a varifocal lens and a fixed lens? How does varifocal lens enhance the effectiveness of your home security system? 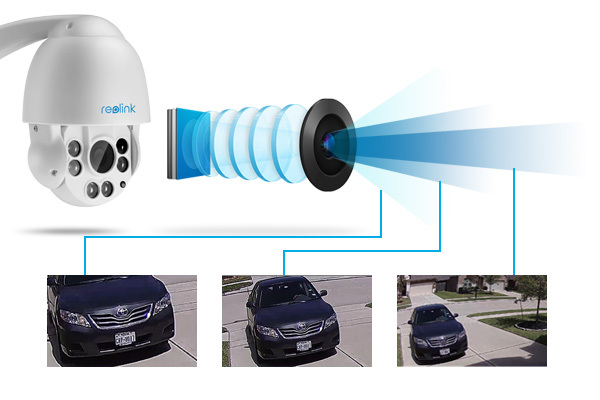 Don’t miss this post covering all-round information about varifocal lens security cameras. What is a Varifocal Lens Security Camera? What is the meaning of varifocal lens in CCTV cameras? Simply put, a varifocal lens is a lens that can zoom in and out. You can adjust the lens so that it captures a wider area or so that it focuses in more detail on a smaller area. Varifocal lenses come in various aperture sizes. Generally, the smallest aperture size of varifocal lenses used in home security cameras is 2.8-12mm, and the largest is 5-100mm. A larger aperture means that you can zoom in closer and view images in more details, while a smaller aperture means that you can zoom out further to see a wider area. The main difference between a varifocal lens and a fixed lens is that the former can zoom in and out, but the latter cannot. Therefore, varifocal security cameras usually see a larger field of view, while surveillance cameras with fixed lenses only have a narrow viewing angle. A fixed lens is set to focus on objects at a certain distance, and it cannot be adjusted. It is a bit like those disposable cameras you used to take on school field trips in middle school, where you cannot adjust the zoom. Many security cameras used fixed lenses because it is useful to have the camera always focus on the same area of the house. If your camera has the right lens to let you see in detail what is happening on your driveway, then it is the right lens for that purpose. 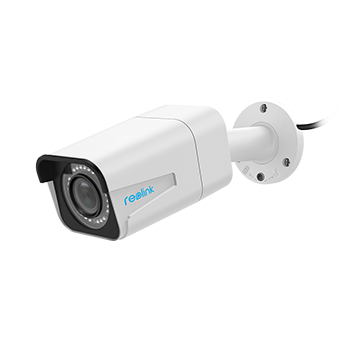 Varifocal lens security cameras are security cameras with lenses where you can adjust the zoom so that you can focus on objects that are closer or farther away. Some varifocal lenses have manually adjustable zoom. Once you have the camera positioned in the right place outside your house, you can adjust it so that it captures a big enough area but also allows you to see images in enough detail. Some varifocal lens cameras change focus automatically, reacting to the images and motion that are within their view. Unlike a fixed lens camera, a varifocal security camera gives you more freedom and flexibility to choose an installation spots. Outdoor security cameras with varifocal lens help you monitor large outdoor areas, such as front yard, back yard, parking lots. Installing varifocal security cameras at front door can view a wide area in front of your house. Varifocal cameras used for business are often seen in warehouses to protect properties. A more advanced type – PTZ camera, not only allows for changing the field of view, but also enables horizontal and vertical rotation. So you don’t miss a single detail of any area. Another benefit of varifocal surveillance cameras for home is that it can adjust focal length to change the field of view. You can zoom in until you see the exact clear view, or zoom out to capture a wide picture as you want. Either zooming in or out, the picture quality will not be damaged. The image remains a super 4MP HD if it is a 4MP HD security camera. If you want to capture a different angle of view with a fixed lens camera, you’ll have to reinstall it and change its location. Reinstalling process involves relocating, drilling and wiring. This costs you extra time and money and energy in the long run. A varifocal lens security camera help clear the headache of frequent reinstallation. If the varifocal camera has WiFi or PoE enabled, the installation process can be much easier. Whether the security camera has a fixed lens or a varifocal lens, there is always a trade-off between the size of the area that the lens can capture and the level of detail in which it can record close up images. The larger the aperture of the varifocal lens, the closer you can zoom in on objects and the more you can see them in detail. If a varifocal security camera is not working well, you can adjust the angle of view and focus on a varifocal lens, via the security camera software. When you are choosing a varifocal lens security camera, it is a good idea to discuss your options with a salesperson at the security camera store. If possible, you can view live footage of the outside of the store through cameras with various types of lenses. If you are buying a home security camera with a varifocal lens online, it is a good idea to compare various shops and to read reviews. 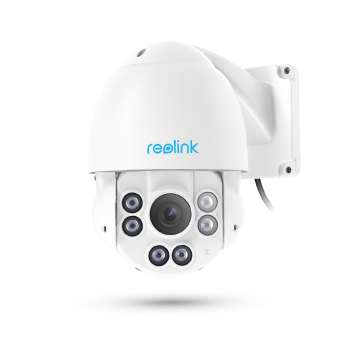 Recently 4X varifocal dome and bullet security cameras are popular the market. Go to check varifocal cameras for sale on Amazon and other security camera online stores. This entry was posted in Buyer's Guide and tagged Security Camera Lens, varifocal lens, varifocal lens vs fixed lens.